Do you want to be the center of attention at any car gathering? Forget an over restored piece of American muscle, or some overpriced piece of Eurotrash. 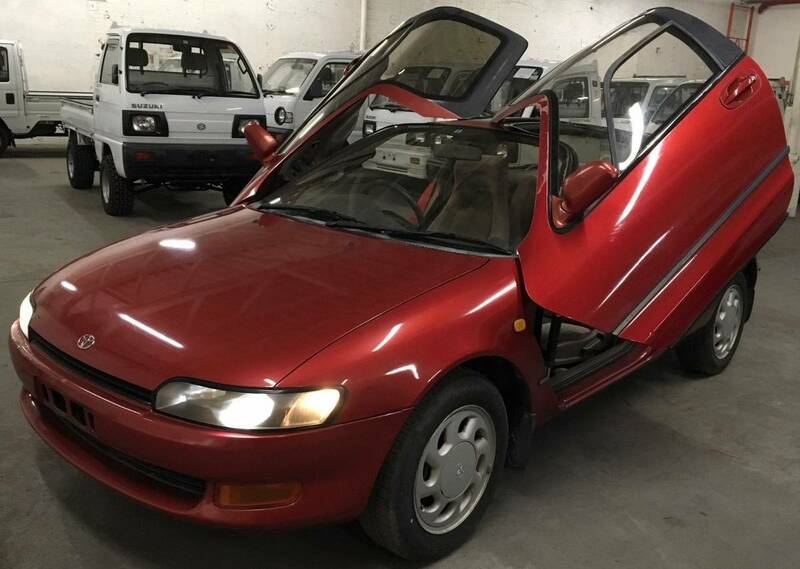 And forget everything you know about getting attention...just pop open one of the scissors/wing doors on your Toyota Sera and attract car guys like a free beer. 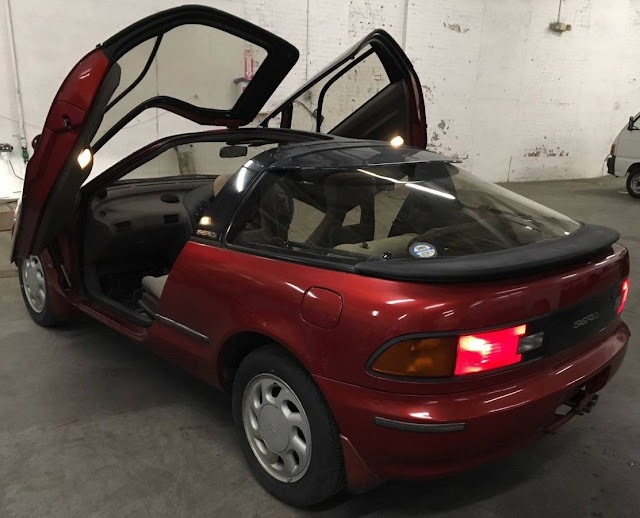 Find this 1991 Toyota Sera offered for $7200 on Las Vegas, NV craigslist. Tip from Rock On! You want something different, that makes people say "WHAT THE F#@K IS THAT!!!" Up for sale is my 1991 Right Hand Drive RHD, Toyota Sera. Has been called the Japanese Delorean and also the Glasshouse. It's currently the ONLY one Registered in ALL of Nevada. And one of around 50 that has ever been imported into the USA. Stock, just came off the boat... But its FULLY TITLED AND REGISTERED ALREADY !!!!!!! Has a clean Nevada Title !!!! Doors were actually like that from that when they made the Sera, New Sturts were just installed, as the originals were starting to sag. Needs a good cleaning, and a bit of TLC (some of the trim could use painting), and few things here or there but totally drivable as is. Summer is almost here, get ready to go hit Espresso and Exotics of Las Vegas. It has a 4 Cylinder gasoline engine with an automatic transmission built on the Toyota Corolla Platform. The Car starts right up, drives perfectly everything is in good physical and mechanical condition. The timing belt was replaced at 71k miles and the car now has only 83k miles. Has aftermarket Japanese stereo in it, but the original is in the trunk. Call/Text me day or night at show contact info ... Please only Text or call if you have cash in hand and are truly interested. Not looking to just show it off to people that want to see it, without actually being in a place to buy, Sorry my time is presious right now. I scanned all the pix in the ad. Apparently, those doors do not close. Might make it a bit hard to drive. And you'd get a bit wet when it rains. Come to think of it, may not be a good car for regions where it snows (you'd get both cold *and* wet riding around with those doors up). Maybe that's why the car wound up in Vegas? Good choice...not exactly falling off trees around here, but you can find em. Were any kei cars sold new in Canuckistan? I remember seeing a Honda beat last time I was up there. Not sure, but Canada's import rule is only 15 years vs. 25 in the US. Bob, I'm 6'0" tall (182.88cm to be exact), and I just discovered that I actually fit in an AZ1. It was tight but doable. The skylight roof panel in the door allows my head to fit into the roof, like a built-in Gurney bubble. They are super neat little cars. Haven't driven one though. No, we never had new Kei cars in Canuckistan, but the 15 year rule means we have had a fair number of them for quite some time. Oh oh..... thanks to @Carter now I have to make the struggle real. BaT auctions play with my emotions. With 6 days to go, they often seem within my grasp, then in the final two hours it all goes to hell. I could never make up my mind if that mean that the name was indicative of "car of the future" or a generally fatelist approach to safety. Can't believe that no one else made this comment before me. I am humbled by your ability to inflict punnish-ment on us. You are, indeed, cunning linguists.